Santa Cruz, California - This 18-year-old girl is pretty cool. How not, young girl full name Cayla Rives is able to break the highest speed record with a Royal Enfield motorbike. Can be more than 200 km / h! Cayla rides a Royal Enfield Continental GT 650 Twin motorbike that has the latest two-cylinder 650 cc engine from Royal Enfield. Of course this motorbike is not a standard motorbike but a lot of modifications so that it can be driven at high speed at the Bonneville Salt Flats. Cayla was able to drive a motorbike that had been modified by S & S Cycles / Harris Performance at 157 miles per hour. That is, the motor is driven up to 252 km / hour! "It was very happy. We broke the first record to 130 miles per hour (209 km / h), but we knew it was just the beginning. So we did several attempts afterwards. And it finally got up to 157 miles per hour and I felt very happy , "Cayla said when met updetails.com in Santa Cruz, California, United States, Wednesday (09/26/2018) local time. He said, initially he estimated it was only 130 miles per hour. The target was only 150 miles per hour (241 km / h), but he could surpass it. "The motor is very smooth, Royal Enfield makes this bike very well. This is the smoothest 650 cc engine I've ever tried," said the 18-year-old girl who often took part in the drag race. Royal Enfield CEO Siddharta Lal said that the motorbike was not a standard motorbike. But at least, he said, young people can be inspired. "When you see that, maybe they will come to our outlet and buy our motorbikes. Yes, this is to show in a custom form, how far the motor can be modified. As you can see here, with a lot of effort we can break a record of 157 miles per hour "It's very fast. It's not a standard motorbike, but it's to inspire people," Sid said. 0 Response to "Crazy! 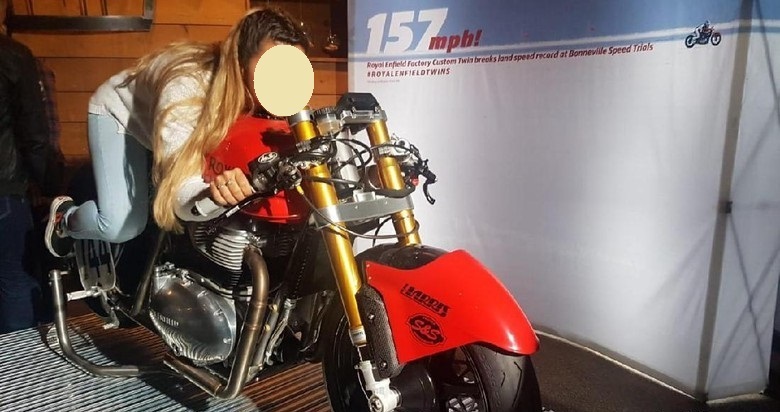 18-year-old girl broke a 200 km / hour record of rising Royal Enfield"